First of all…is this technically speaking a rhum? The question and debate is open. Sure, it’s made of fresh sugar cane juice, and there for a rhum agricole. But then again, during fermentation certain spices and herbs are added (in this case wild aniseed, citronella and ginger), making it just a bit different. Secondly…clairin: the name is often used and abused in Haïti to refer to low quality headache rum. Real clairin however can be a fantastic product! Nose: to be honest, this isn’t by far the most inviting nose a rum has ever had. Unless you are a professional painter and used to these kind of aromas. It’s really a mixture of fermenting sugarcane juice, old motor oil, nail polish remover, olives and an old fisherman’s harbor in Scotland, where the brime is hitting you right into the face. Very vegetal nose with some wet leafs. The nose actually reminds me very much of its far cousin from Brazil: cachaça. Taste: never judge a clairin by its nose. This is surprisingly pleasant in the mouth. Punchy, but oh so rich. Again very vegetal, with loads of sugarcane and grass (the green kind, not the kind they smoke in Jamaica). Again a bit similar to cachaça, but with a serious edge. This is brutal, raw, uncensored. It even has some distinct smoky notes. Also a very fresh touch…the influence of the aniseed and ginger during the fermentation maybe? Finish: fresh and not too sweet, with…no surprise there: lots of sugarcane. Also some agrumes and that slightly brutal smokiness again. Our Score: **** Clairin…love it or hate it. I love it; and think every rum lover should have at least one of these brutal beauties in his bar! The originally Dutch rum distillery Uitvlugt was one of the very last to close its doors in the Demerara region. In 2000 the last rum was produced at Uitvlugt (I wonder how they pronounce it it Guyana…) before the stills were moved to the Diamond distillery. The stills being two French four column Savalle stills. Savalle is a French manufacturer of stills The Savalle Stills at Diamond are used for a multiple number of marks. To the exception of the El Dorado 12 and 15 blend, all are using one or more marks of the Savalle Stills. Taste: rather sweet and again strong alcohol. The cask actually adds little or nothing to the rum – must have been one very exhausted ex-bourbon cask. Well..it does add one thing: lots of vanilla. I also get some fruity flavours, mainly apricots. Our Score: *** A decent rum, too bad the cask influence is very limited to vanilla, vanilla and vanilla. Talk about rum from Panama, and most people immediate think of Ron Abuelo from the Varela Hermanos distillery. This distillery was established around 1940 by the Spaniard Don José Varela Blanco who emigrated from Spain to Panama in 1908. It was about 30 years later that Don José and his sons began to distil rum; and today the Don Jose Distillery controls and produces about 90 % of all rum in Panama. So about time we try an indy bottling from this famous Panamese distillers. Nose: the ex-bourbon casks immediately show their influence on the aroma. Lots of vanilla, with fine oak sawdust and soft but sweet molasses. I also got some white flowers (lily of the valley) and a pleasant vegetal touch. Cocos oil finishes the range of aromas. Taste: Again rather sweet, candy, and beautiful yet subtle wood influence. As like in the nose lots of vanilla. Also very fruity, but it’s rather hard to put my finger on it. It really is a mixture of all kinds of fruit. I mainly get some mango and pineapple on syrup. Also some pepper and coriander. Finish: long and lasting sweetness without ever getting sticky. At the very end a pleasing little bitter touch. Also some green bananas and acacia honey that stays in the throat for a long time. Our Score : **** . A very nice, sweet and rather soft (for that almost 53 abv that is) rum. Give it a more complexity and depth and it might deserve the whole 5 stars. But 4 stars is a very, very good score. Price? About €160-170…provided you can still score a bottle ! After tasting the New Grove finished in acacia wood (https://sugarcanecollection.wordpress.com/2016/02/15/new-grove-double-cask-acacia/) let’s have a go at that other double matured New Grove. Finished in merisier this time. Merisier or Prunus Avium….wild cherry. Not the most common type of wood for maturing distilled beverages. Nose: the first thing I get in the nose is something rather sour and harsh. I even get some white cabbage. But also some very earthy aromas: humus, wet leafs and wet earth. A rather punchy alcohol influence too. At the end some cherry liquor, and I’m afraid that’s about the only thing about the nose that I like. No, just sniffing this rum it really doesn’t invite you to have a sip. But hey, it wouldn’t be the first time that a rum with a rather unpleasant nose turns out to be a nice tipple! Taste: again a rather alcoholic start, sweet and present molasses. Punchy wood influences too. I actually get burned wood in this rum. Not smoky, but really burned wood. Ever try to taste purified charcoal? (I admit, I did…supposed to be very good to whiten your teeth). Well…it actually has a bit of that same taste. Also a lot of walnut in the taste. Now, I have some mixed feelings with the regular New Grove range (the 5 and 8 yo), but I do love some of their single casks. They sometimes burst with tropical fruits. Alas…there really is not a trace of that fruitiness in this rum. Too bad ! Our Score : ** No, this merisier finishing really ads no value whatsoever to the rum. Au contraire ! One of the things I like about cachaça is the richness and variety in taste, thanks to the possibility of maturing the spirit in all different kinds of wood. I know, for rum or whisky you can use old port, sherry, banyul, cognac or whatever casks; but it always will be oak. White American oak or European oak…but always oak. Now take f.i. a cachaça matured in casks made from umburana wood. It provides a very distinct cinnamon taste. So I was rather glad to find out that the good people at New Grove launched two rums under the ‘double cask’ label. The first one I tasted has received an initial maturation in French oak, and a second maturation in acacia wood. Acacia (aka Thorntree aka Mimosa) has its roots in Africa and Australia. It is not to be confused with what California people call Acacia which is a completely different tree. With New Grove situated on Mauritius – and thus right between Africa and Australia – it’s no wonder the distillery choose this kind of wood for their double cask series. Some of the acacia species are very rich in tannin. Acacia wood has been used in France and Spain for many years to add a new dimension to white wines and in the aging of the incredible sweet wines of Bordeaux, Loire Valley and Gaillac. Acacia wood gives white wines an incredible floral characteristic with added structural mouth feel. No oak flavours. Just the fruit with a floral nose and great mouth feel. Acacia is being used in the US on wines such as Sauvignon Blanc, Pinot Blanc, Viognier, Chardonnay, Pinot Grigio and Chenin Blanc. But enough of all this…let’s find out how the acacia wood influences our rum. Nose: First aromas are rather peppery and a strange but not unpleasant meaty aroma. Rather a-typical but still definitely rum. After some 10 minutes the molasses comes kicking in. We also have some green banana and well hidden a slight metallic aroma. Not sure where this meaty aroma comes from. The rum itself? Not really, because I never found this in any other New Grove. Is this the acacia influence? Let it in the glass half an hour, and the aromas now take me back to my time in college : some warming pipe tobacco (Alström Black, if you know it). Taste: the rum starts a bit dry with subtle fruity undertones (tropical fruits like passion and guave). The alcohol feel is rather soft. A medium sweet rum with soft and very refined molasses. After 10 minutes the fruit gets more juicy and sweeter. What the nose lacked on the fruity side, the taste now delivers. Very succulent but subtle. Yes, this is a very pleasant fruity rum, but really not the ‘right-in-your-face’ kind of fruitiness. It’s much more delicate. Finish: Medium sweet and medium long. Again a very subtle metallic hint and lots of dried fruits now (prunes, apricots). The finish is rather light and thin, lacking a bit of body. But still it’s very tasty. The finish finally delivers some delicate wood influences. Both nose and taste are very OK, but they don’t correspond; with the nose being heavier and more meaty and spicy, and the taste being lighter and more fruity. A nice and interesting rum indeed ! 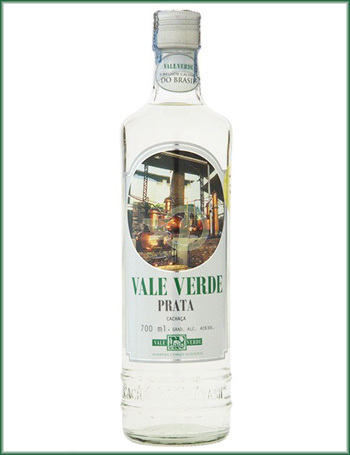 From the award winning distillery at the ecological park of Vale Verde comes this white, unaged cachaça. Unaged is often about the same as undrinkable, only suitable for mixing. But…can we expect more from a prestigious distillery like Vale Verde? More over: can we expect more from a white cachaça with the same price tag as a young matured cachaça (€27-30)? Let’s find out ! Nose: When pouring in my glass, the first very pronounced aromas already enter my nose. Still, the nose is rather soft and very pleasant. Lots of fresh sugar cane juice of course, but without that very typical nose of acid fermented juice that sometimes is so typical for very young and unaged cachaça. I even get some milled grains and a mineral touch (wet slate). After a good 10 minutes, a slight acid note pops up. Taste: A very fresh first attack, without any alcohol bite. Slightly sweet with a fresh citrus touch. Also some more grassy notes and floral influences. Is that rosehip I taste? After a while, it evolves to that rather typical cachaça taste of lychees on syrup. Finish: Again soft and sweet, and warming without becoming too alcoholic. On the cheeks it ends with sweet white fruits. A rather long finish! Silver Seal is Max Righi, an independent Italian bottler, best known for his whiskies. But Silver Seal also bottled loads of rum. Some great rums too! Top of the head I’m thinking of a fantastic Caroni. This 10 yo Barbados comes from the Foursquare distillery. Foursquare Rum Distillery occupies the site of a former sugar factory that dates back to 1636. The distillery was beautifully restored in 1996 combining the historic structure with modern technology, making it one of the most modern in the world. Nose: despite the higher alcohol volume, the nose is soft and pleasant. Tropical fruits, green banana and toasted brioche. Also some herbal touches, caffé latte and warm vanilla. The very juicy nose makes the mouth water. Very rich and inviting indeed. Finish: again rather sweet and very consistent with the taste. And long. Very long ! Our Score: *** . A decent rum – but for that price (expect to pay around €150) you can find much better! And much older.